I honestly couldn’t have been more content. I had just nestled myself into a turquoise blue velvet bar stool and was watching to the single chunky ice cube in my cocktail gently clink the side of my collins glass. 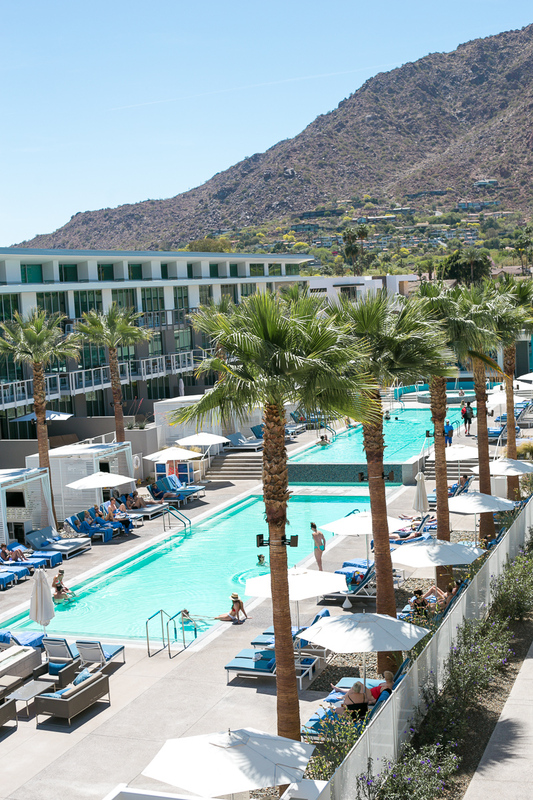 The perfect breeze on my shoulders was divine, created when the warm 4 o’clock Arizona air mixes just so with the air conditioning from the hotel lobby. The smell of gardenias and lilies swirled all around. Now, at the end of my trip to Arizona, looking back, I guess I didn’t know what to expect? I guess I was expecting Palm Springs? After all, I’ve been to the desert many times before, and Scottsdale couldn’t be much different, right? But instead of just more of the same, I found a small town with a very unique and special culture completely different from California or anywhere else I’ve visited yet. Just a quick plane ride from Los Angles is this unique oasis in the desert, Scottsdale, Arizona. Being in Scottsdale for a short weekend felt like a vacation in the middle of nowhere, far away from the hustle and bustle of Los Angeles. Things here move a little slower, and with a little more ease. The people seem to carry themselves with a Mad Men-esque allure that I desperately wanted to be a part of. The city vibed both culture and experience. 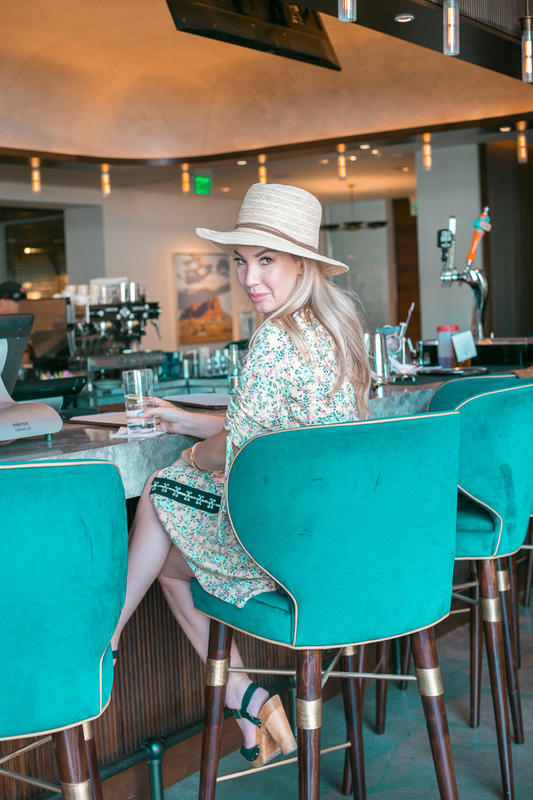 Here are some of my top recommendations for a quick weekend getaway in Scottsdale! That smell of gardenias that I mentioned before? Well, that was a custom scent made specifically for the hotel where I was staying. It is all about the details, people, and this is just one of the many things that contributed to what amounted to a ten-out-of-ten hotel experience for me. We go on vacation to feel special, pampered, luxurious, stress free, and, dare I say, a little bit bougie? The Mountain Shadows resort, nailed these little details and and I LOVED my stay there! I traveled solo on this one, but found myself talking to John a LOT about how beautiful my room was and how unique the decor and interior design were at the hotel. If you’re looking for a place to stay, I give this place my highest recommendation, and would be thrilled to stay here again. 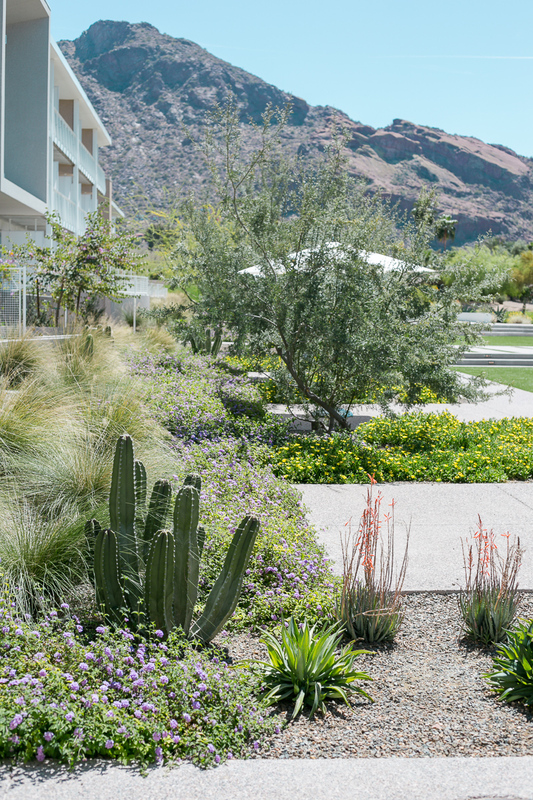 The entire resort played into that chic-yet-leisurely Scottsdale vibe. You can roam the grounds, which seamlessly flow from inside to out. There are cool mid-mod style seating areas everywhere, some tucked away in random corners where you could have a private rendezvous. Or maybe lose yourself in a little stroll outside to watch the golfers coming in on the 18th hole as the setting sun illuminates everything in that rich golden light. Magical. I chose to indulge by spending an entire day absorbing some organic Vitamin-D at the hotel’s resort style pool. There were pool side cabanas, full service drinks and food, and comfy lounge chairs to add to the experience. For me, one of the best parts of any weekend getaway is dressing up and hitting the town to try out some new eats. Eating is always one of my favorite activities, and in Scottsdale I couldn’t more highly recommend FnB Restaurant for your own experience. 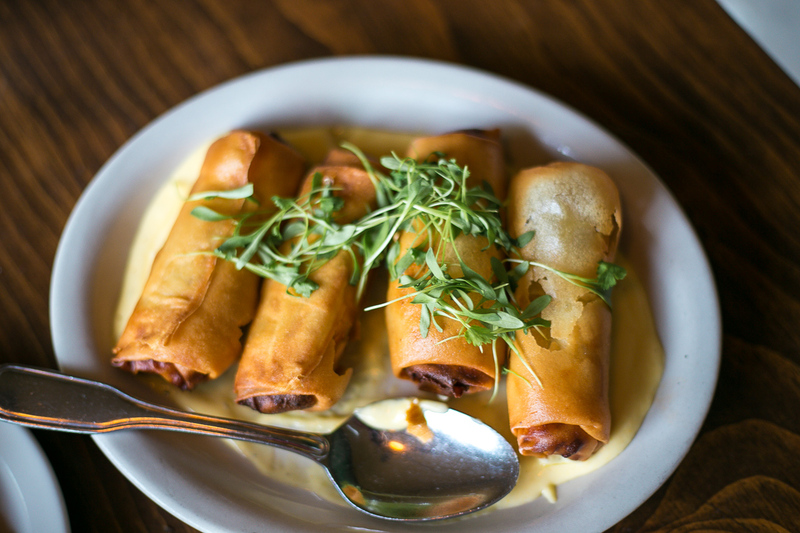 It’s easy to taste why this restaurant has received so many awards and such a high yelp review. I’m not usually a “let’s go out to a nice restaurant and order the veggies” kind of girl, but FnB does a phenomenal job of bringing the freshest, most delightful, locally sourced produce right to your table. 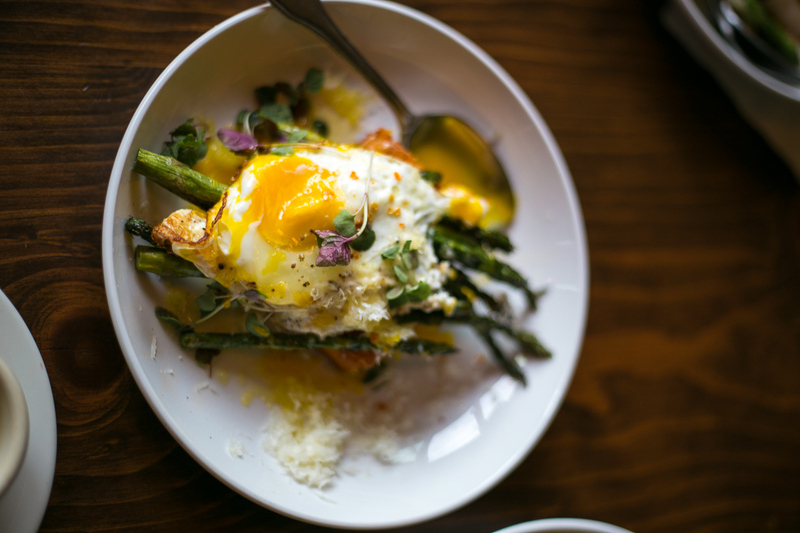 With the heat outside, FnB offers cool, crispy, fresh, mouthwatering dishes. My favorite part about the experience here was the entirely Arizona-only wine list. Yes, ARIZONA makes wine. Delicious wine, actually. 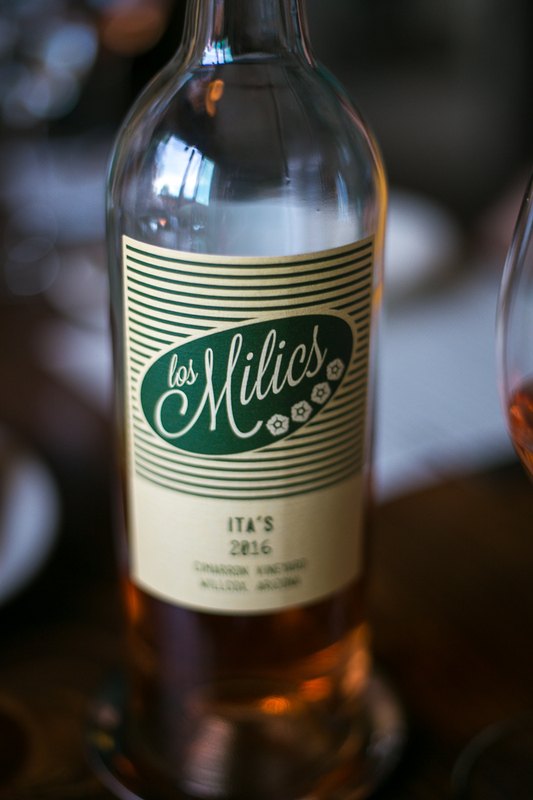 One of the restaurant owners even has his own label and has created a perfect pairings of his Arizona wines with these Arizona dishes. Can’t think of a better way to experience Scottsdale food and wine than this place. As an aside, inevitably that “hitting the town” wears me out and I ALWAYS end up eating at least one meal at the hotel (which is usually pretty mediocre). But I had a solo brunch date at the hotel restaurant Hearth 61 and was very pleasantly surprised. The beautiful view was the perfect compliment as I devoured my banana, ricotta, and bacon pancakes! As if eating, and pooling wasn’t all the fun I could handle on my visit, I decided to check something off my bucket list! I mean, a hot air balloon ride?! Yes, PLEASE! I’ll start with pics on this one because these are my favorite images from the trip! You might not yet know this about me, but I am OBSESSED with safety and emergency preparedness. (John has a backpack filled with supplies at his desk at work in case the big one hits LA, lol) The first question people have asked me about the balloon experience is, “was it scary?” And the answer is, honestly, not in the slightest. It was, in fact, the complete opposite. Not to be dramatic or anything, but in conversations with my sisters, I actually likened the experience to what I imagine it would feel like to have your soul leave your body and float off of the earth. (okay, lol, yes that’s very dramatic, but perhaps it helps paint a picture of the complete serenity of the experience). 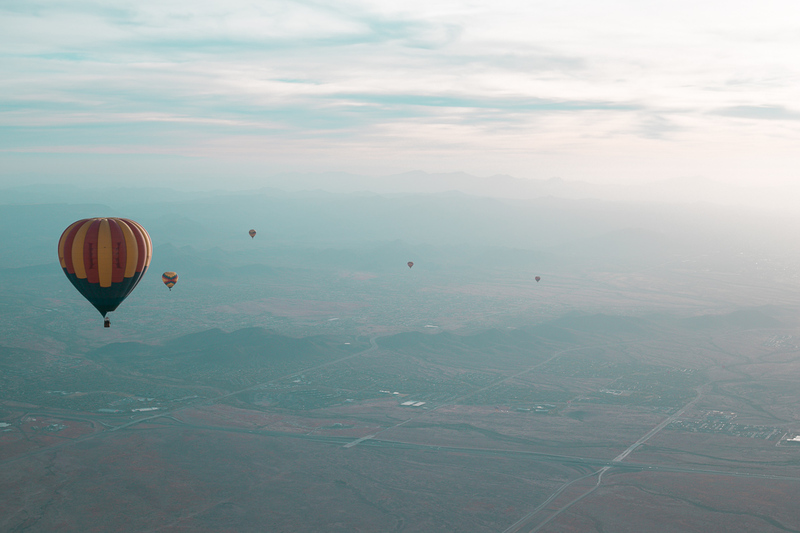 It should be called a hot air balloon float because you are kind of just existing in the air as opposed to finding a destination. It’s peaceful, calm, relaxing and gentle. I checked off this bucket list item with the Rainbow Rhyders balloon company. They boast that they’re the #1 balloon company around and they have the Trip Advisor and Yelp reviews to prove it. They are top-notch and extremely professional. 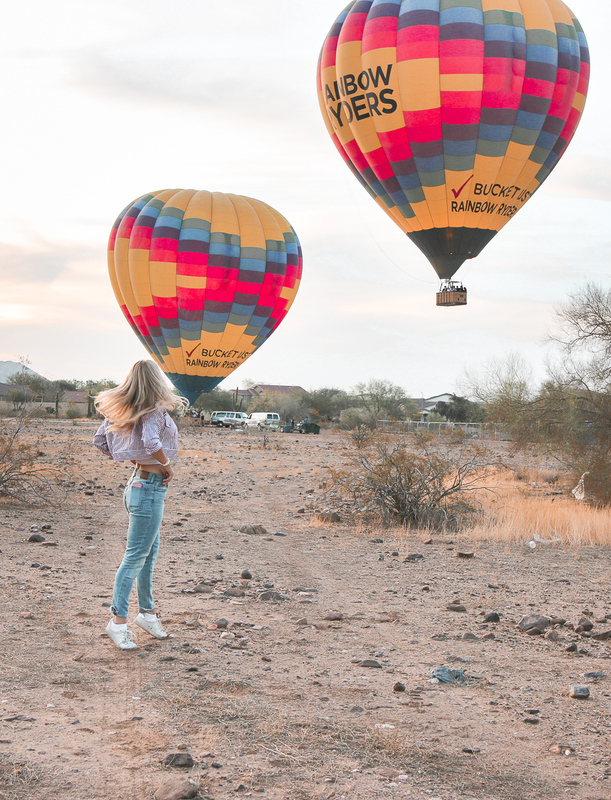 Did you know that hot air balloon operators are required to have a pilot’s license? The pilots go out of their way to explain the whole process, history, and inner workings of balloon flights. My balloon ride started at sunrise and ended with a mimosa toast! Perfection. In the days after this trip, I found myself yearning to be back in that velvet seat with a drink in my hand. Now, every time that I smell gardenias and lilies I think of the amazing time that I had exploring Scottsdale and I find myself on the internet looking for flights for another weekend back!